Dinner: We tried Shogun Sushi (Ste 225, 1807 W Slaughter Ln, Austin, TX‎ - (512) 292-1580‎) for dinner again. This time we made sure we had ample time to sit and eat. It took a while to get our food, just like last time. When we arrived, there was only one other table in the restaurant (a couple with two young children). We ordered seaweed salad and green tea to start and just before the seaweed salad came I turned in our sushi order. It took a little over fifteen minutes for our first sushi items to arrive (according to the camera's timestamps). 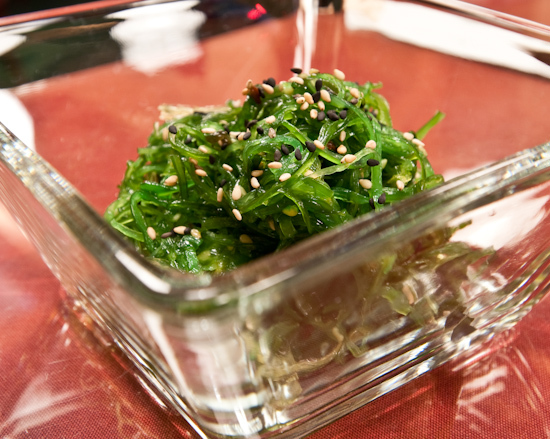 The seaweed salad ($4.50) was passable, but we both thought there was an odd acidic taste to it that we didn't quite enjoy. Our first plate of sushi arrived - two orders of sake nigiri (salmon) ($5.50 for two pieces) and a Rock & Roll roll (shrimp tempura) ($11). (Since we had tried several nigiri last time, I thought we'd try some of their rolls.) There really wasn't much explanation as to what was in a Rock & Roll except that it contained fried shrimp. 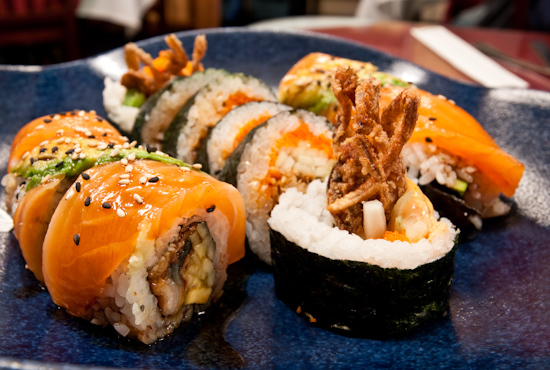 Where we come from (San Francisco Bay Area), Dragon Rolls are tempura shrimp rolls with unagi and avocado on top. Here the Dragon Roll is unagi with unagi and avocado on top. So I ordered the Rock & Roll hoping it would be the Dragon Roll that I wanted (it was the only menu item with tempura shrimp in a roll). It was not, it was tempura shrimp with a spicy sauce, cucumber, and tobiko. Not bad, but I personally don't like spicy sauces on my sushi. 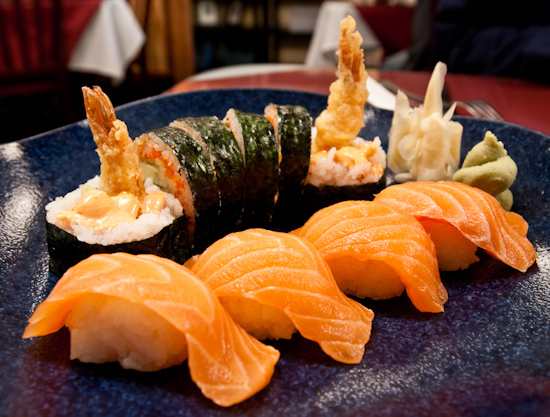 This stems from consuming spicy tuna rolls which are often made with the fragments and scrapings of tuna that cannot be used for maguro nigiri - the possible off flavors are masked through the use of spicy sauce. To me, the use of a spicy sauce in what should be naturally flavorful components is an attempt to try to mask something. I suspect that wasn't the case here - they were just trying to make the roll a bit special I suppose. The salmon nigiri was thinly sliced with a small dollop of rice. Although the fish was pretty fresh, there was nothing special about it. The rice was very good - discrete, properly cooked grains with a hint of vinegar. At $5.50 for two pieces though, it's almost as expensive as Uchi ($3 per piece) and Uchi's salmon is extremely fresh. Our second plate had a Spider roll (soft shell crab) ($13) and Alligator Roll (eel inside, covered with salmon and avocado) ($13). The spider roll here is $4 more than Uchi and $2 more than Musashino. The soft shell crab was over fried and you could taste the frying oil - not a good thing when you have something as delicately flavored as soft shell crab. The rest of the roll was almost identical in flavor to the Rock & Roll (including the unwelcome spicy sauce). We much preferred the tempura shrimp over the soft shell crab. The Alligator Roll was a problem for me since the unagi was not properly sliced and there were numerous unagi bones which I either swallowed or pulled out. 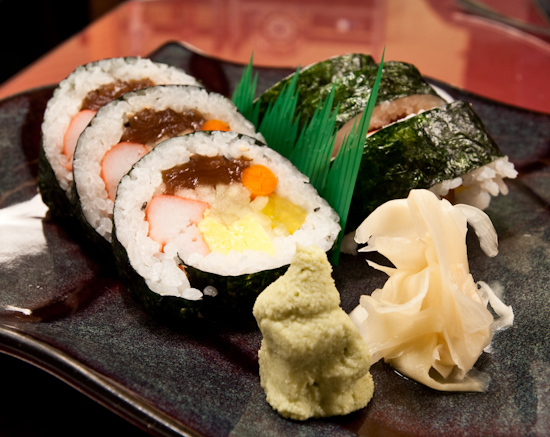 It's not unusual for unagi to have bones, but often a sushi chef can slice to minimize the number. We still needed a bit more food, so I decided to try their futomaki (tamago, kani, oriental vegetable) which at $9 is the most expensive futomaki I have ever seen. It's also odd to see kani (crab - in this case imitation crab stick) in a futomaki. I really like the flavor and texture in their futomaki, but there's no reason it should be $9. Overall, the taste of the food was fine - but the prices were much too high for the quality and the quantity. The rice was quite good though - I have to keep mentioning that. Something else I noticed was that they had escolar nigiri available ($5.25) but the described it as Alaskan cod which it isn't even close to. Lunch: I cooked some chicken thighs which I brined in salt and beer (in preparation for a Beer-themed Food Blogger's Potluck this Sunday) but I had over-brined it and it was inedible (too salty). 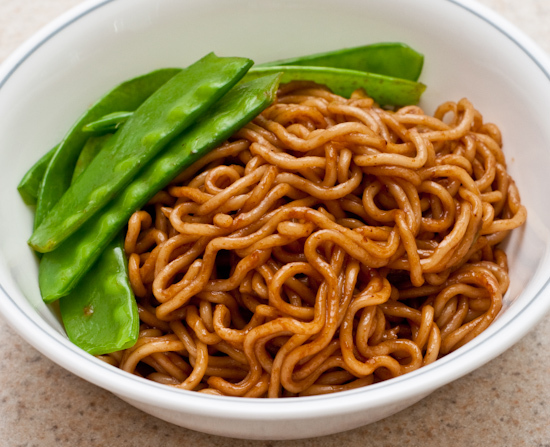 Tina cooked some instant noodles tossed with a black bean sauce which we ate with blanched snow peas.